Occasionally, promising aviation projects can turn into a nightmare. Such was the case for Dassault whose Falcon 5X, originally rolled out at Bordeaux amid a fanfare of music and light in June, 2015 found itself disadvantaged by its flawed engines. The continuing technical delays to Safran’s Silvercrest powerplants finally forced Dassault’s patience to run out and, in December, 2017 the company finally decided to cancel the Silvercrest contract and move on. With remarkable speed, the Falcon 5X has been re-imagined and now emerges as the bigger and better Falcon 6X. The new aircraft addresses the same market as the Falcon 5X but justifies its new title by offering quite a bit more. 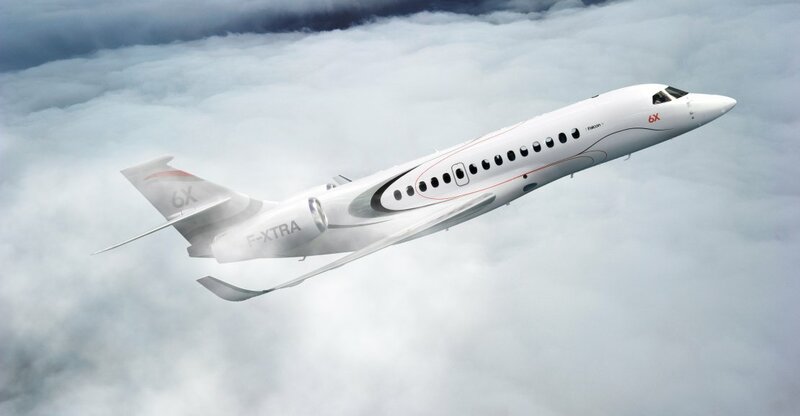 At the formal launch in Paris on February 28, Dassault’s Chairman and CEO, Eric Trappier explained: “We wanted to further push the boundaries with this new aircraft to provide the best flight experience possible using today’s know-how. Having flown the Falcon 5X prototype with Silvercrest test engines, Dassault has made progress in verifying the aerodynamic characteristics of the aircraft – but finding a new powerplant was not so easy. The Silvercrest turbofans offered a combination of light weight, performance and fuel efficiency unmatched by any competing engines. Fortunately, a solution is at hand with Pratt & Whitney Canada’s well established PurePower PW800 which has accumulated over 20,000 test hours and has a reputation for maintainability and reliability. Yet it’s not as simple as just hanging new engines on the existing 5X airframe. Whereas the Silvercrest was an 11,450lbst engine, the PW812D proposed for the Falcon 6X is in the 13,000-14,000lbst category and is larger and heavier. According to Dassault’s Senior Vice President, Civil Aircraft, Olivier Villa, “We want to maximize the use of the Falcon 5X technology but the new engines mean we must redesign and strengthen various parts of the fuselage, particularly around the pylon area”. The Falcon 6X also has a longer 84 ft 3in fuselage (compared with 82ft 7in for the Falcon 5X) with an addition ahead of the wing allowing for a 20-inch increase in cabin length and an additional belly fuel tank. Also introduced to the pressurized tank system is an OBIGGS active inerting system which reduces the danger of fuel ignition by injecting nitrogen into the empty tank spaces. Quite apart from the structural changes to the fuselage, there are also revisions to the highly efficient Falcon 5X wing which has been redesigned to minimize the effects of turbulence and enhance the safety of the aircraft’s operations. The structural architecture has been changed and the already complex arrangement of control surfaces (including three leading edge slats and a curved trailing edge with flaps and airbrakes) has been further enhanced with the addition of flaperons – not used before on a business jet. These can work as flaps or ailerons and they are claimed to improve control during approaches, particularly with steep descents. Because of the aircraft’s fly-by-wire systems these surfaces are automatically deployed using the Falcon’s next generation digital flight control system. From the passenger’s perspective, Dassault claims the Falcon 6X’s cabin is wider than even the Gulfstream G650 at 86ins and offers an inch more cabin headroom. It has 15% more cabin volume than its direct competitor, the Gulfstream G500. The new cabin dimensions have given the opportunity for new internal layouts for 12, 13, 14 or 16 passengers with an aft restroom and alternative entry area layouts with the option of a crew rest area in addition to the galley. There are new designs for the cabin seating and fittings and the cabin will be well illuminated with 14 windows on each side. In terms of passenger comfort the pressurization is set at 3,900ft at FL410 and the cabin should be as quiet as the Falcon 8X with a high level of air quality. Further illumination in the galley area is provided by a skylight window in the roof which will be welcomed by cabin crew and is a first among business aircraft. The redesign has allowed Dassault’s team to increase the range of the Falcon 6X by 300 nautical miles to 5,500nm – which gives it a significant advantage over its direct competition. With eight passengers and a cruising speed of Mach 0.8 the aircraft can fly from Paris to Cape Town or Tokyo or from Beijing to Melbourne or San Francisco. The maximum cruising speed is 0.9 Mach. At the front of the aircraft there is an all-new cockpit which is wide and affords easy access. The Falcon 6X has Dassault’s third generation EASy III all digital flight deck together with the FalconSphere II electronic flight bag, and there will be dual head-up displays (HUDs) to display the FalconEye CVS (Combined Vision System) which brings together both enhanced vision and synthetic vision capability. As for the Falcon 5X prototype “its engines will be returned to Safran and many components will be used to create the prototype Falcon 6X”, Trappier explains. Timing for the program sees the prototype Falcon 6X flying in early 2021 and certification in 2022. “Of course, I am not happy with the delay to our original program,” Trappier summarizes, “but this aircraft will have a 30-year life and I believe customers will wait for it – and be very happy with the outcome”.